Location: Condette, in the Pas-de-Calais departement of France (Nord-Pas-de-Calais Region). Built: 12th-19th and 20th century. Ownership / Access: Conseil général du Pas-de-Calais. Notes: Château d'Hardelot is a castle located in the municipality of Condette in the Pas-de-Calais, France. 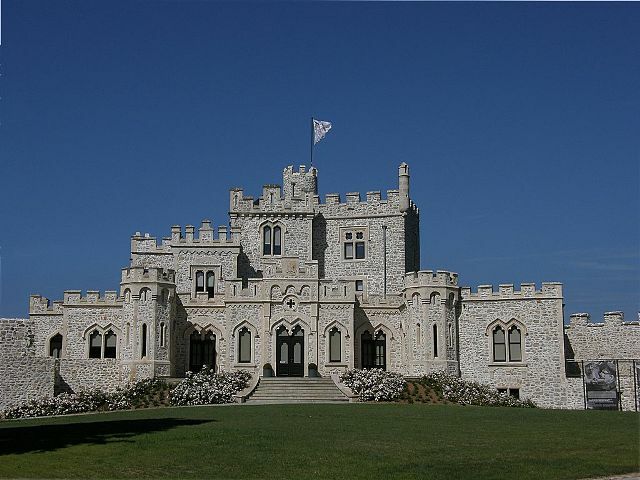 The present castle is a mansion completed in the mid-nineteenth century on foundations dating back to 1222. It has the shape of a polygon with nine towers, surrounded by two large concentric ditches and installed on a hill overlooking the marshes and Lake mirrors. It is close to the resort town of Hardelot-Plage station to which he gave his name. Today it houses the Cultural Centre of the Entente Cordiale, dedicated to relations between the French and the English, and every summer the Midsummer Festival. It is the center of the regional natural reserve of the marshes of Condette.